The collection includes the Berry Street Essay, which for the first time was multivocal and featured a panel of speakers including Rev. Dr. Kristen L. Harper, Rev. Mel Hoover, Rev. Ashley Horan, Rev. Dr. Adam Robersmith, and Rev. 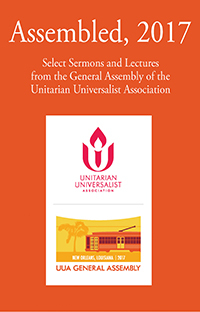 Marta Valentín; the Sophia Lyon Fahs Lecture by Dr. Robin DiAngelo; the Ware Lecture by Bryan Stevenson; the sermons from the Service of the Living Tradition (Rev. Cheryl M. Walker) and the Sunday morning worship service (Rev. Mara J. Dowdall). “The times we live in right now are ripe with the potential for great transformational seeds to be planted. We may not see all of them blossom into the radically inclusive, compassionately welcoming, justice-demanding faith and world we dream of. We may not live long enough to reap the benefits of the work we do together. And there will be times when the work of creating the world we call Beloved Community will seem too hard and we will want to just give up in despair. Times when we tire of preaching the same sermon week after week: “Make the world a better place.” When we wonder if anyone notices the work we are doing, as flawed and as imperfect as it is. Days when if we see one more tweet, one more post, one more headline, we’ll just scream!